Both Texas natives, they came aboard the kids’ movies as the voices of Reggie and Jake early on the production process. 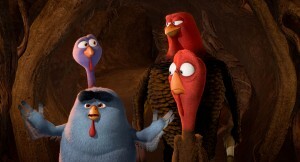 Wilson plays Reggie, a bird that is spared from becoming the main entrée at the White House when he is granted a presidential pardon. Sent to live a cushy life at Camp David, Reggie thinks he has it all. Then he is called upon by Jake, a big, heroic turkey on a mission to save all turkeys by helping him track down a secret government time machine device. The two wind up in the untested machine and traveling back to colonial times where they set about to stop the humans from eating them and starting an annual tradition. We recently caught up with the two funnymen, who came on board the family friendly animated movie because they were friends with executives from Texas-based Reel FX, the animation house behind the movie. Writer/director Jimmy Haywood said it was great working with actors who are veteran improvisers. They always found a way to make the scene better than I imagined,” he says. Friends in real life, Harrelson and Wilson talked turkey and making a film their children actually could watch. Q: What’s your favorite Thanksgiving memory? Is there a dish you’re well known for? Were there any dramas that happened during a Thanksgiving dinner? Wilson: I have lots of Thanksgiving memories. We would always have a football game on during Thanksgiving that would lead to a lot of arguments. The (Dallas) Cowboys game was always on during Thanksgiving. My favorite (food) was my mom’s stuffing, the turkey—that’s pretty good—the cranberry sauce, apple pie. Harrelson: The thing I remember most about Thanksgiving was after I’d moved to New York, I would come back for Thanksgiving to where (my family was) living in Lebanon, Ohio, where my mom still lives. We would just have the best time… Nah, I don’t remember much. I can’t fake this. Q: How important was it to do a project that you can share with your family versus other things you’ve done that are not age-appropriate for your kids? Q: You guys accomplished a great buddy vibe even though you didn’t get to work in the recording booth together. Harrelson: We were in the room together a little too much. No, we did the first session together but then it was like, we’re not in the same place at the same time. Q: Was it hard to get the rapport recording at different times and locations? Harrelson: No. He’d do something funny and then I’d try to respond. Wilson: We did have a couple of sessions together. I don’t know if there was any more magic in those sessions when we were together than the ones where we were apart. Wilson: Toronto. I remember that one. Harrelson: Yeah, that was rough. Wilson: (Harrelson) likes to have the last word so sometimes it’s best not to have him there in the room with me. I can get my bits in. Harrelson: I don’t know what you mean by that. You can have the last word anytime. Q: This film is heavily filled with vegetarian ideology. Have you turned to vegetarianism or veganism after sympathizing or empathizing with the turkeys in this story? Wilson: I wasn’t thinking that when I wanted to play a turkey, a jive turkey, that it was vegan ideology. I think it was more a funny idea for these guys to be traveling back in time. We could just as easily been playing soybeans traveling to Japan to get tofu out of miso. We just thought turkeys were funnier than soybeans. Q: They usually video record you when you recording your voice in the booth. 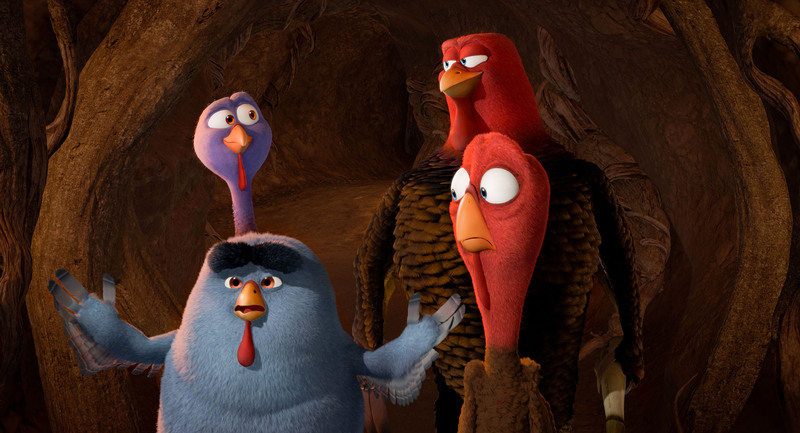 Did you see anything of yourselves in the turkeys we see on screen? Wilson: I did see some of myself. It was uncomfortable. Q: The gluts and the pecs are Woody’s for sure, right? Harrelson: I didn’t want to say it, but I’m glad you brought it up. Q: Woody, are you gratified that something you live on a daily basis—a healthy lifestyle—you’re putting in a film. Kids can be so influenced by what they see in the movies. Harrelson: I’d sooner eat turkey than pizza so I’m not so sure… I’d better stop right there. Q: Was there something that surprised you about each other when you met? Harrelson: I was surprised that Owen takes this stuff very seriously. The first session he came in and was all in feathers. He had that thing (pointing to his chin.). What do you call it? Harrelson: Yeah, that was weird. The wattle. He takes it seriously, very very seriously. Q: In the film, Reggie’s kind of an outcast. Have you ever felt like that? Wilson: Yea, my name. As a kid, you want to fit in, and there weren’t too many other kids named Owen. That was always the first rule I’d have in the neighborhood when we played a game, you’d have to have a new name for the game, and mine was always Jim Johnson. So I think every kid can kind of relate to that. Harrelson: Jim Johnson? J.J.! Buddy! Q: If you could travel back in time, where would you go? Wilson: Do we have to go back? Harrelson: I kind of like the period Owen went back to (the Roaring 20s) in “Midnight in Paris.” That was a good era. It would be nice to run into Henry Miller and some other fun people. Wilson: (nodding) Yeah, that would be a good one. This is probably my inner 12-year-old speaking but I think about dinosaurs or Custer’s last stand. I’d like to see some action. Harrelson: With his (blond) hair, he wouldn’t fare too well. Wilson: I mean safely (watching) what’s happening from a dugout. Q: How did you come to be part of this film? Harrelson: Our good buddy Tom Kartsotis is the guy who owns (the animation studio) Real FX, so we were in this from the beginning. Wilson: I remember being excited when Amy (Poehler, who plays Jenny, a 17th century turkey they meet) signed on. That seemed like, “Wow!” That elevated us. Q: If you could travel back to a moment in your life what would you want to re-live? Wilson: Wow! Talk about taking it totally back to the genesis. Harrelson: Yeah, but talking like I talk now. “Hi, mom!” Yeah, that would be wild. Q: What age is this movie appropriate for? Wilson: My son’s almost three. He was watching a clip the other day that we were showing, and he seemed to love it. So I would think from 2.9 (years of age) all the way up to teenagers. Q: Do you predict a sharp increase in sales of the food delivery business this Thanksgiving?